The Gaia Hypothesis, named after the caring Greek Goddess of the Earth, has held sway in thought about planetary systems for decades now, and posits that life is an intrinsically balancing influence which acts to stabilise the Earth’s environment to maintain its suitability for life. Here, Ward proposes an important alternative interpretation of events over Earth’s history, that life is not inherently regulative, but destabilising and self-destructive. He calls this idea the Medea Hypothesis, named after the wife of Jason the Argonaut who killed her own children. A central tenet of the Gaia Hypothesis is that the interactions between life and planetary systems (such as elemental cycling and atmospheric composition, temperature, and so on) are largely negative feedback loops, so that the interplay between the living and non-living world acts as a balance force to maintain stability. Ward argues that actually most of the important interactions have a positive feedback nature, and so life on the whole acts to push the environment away from life-sustaining equilibria. Because, he says, life is inherently Darwinian and so competitive and driven to seek short-term gains in fecundity, life is thus inherently biocidal, suicidal. Ward discusses twelve examples of Medean events over the history of the Earth – occasions when the action of life itself served to drive mass extinction. Ward’s position is that contrary to the prediction of a Gaian framework, life will not act to extend the period of habitability of the planet, but the biosphere will shorten its own lifespan and inexorably drive surface life to extinction. With plants so effectively sucking carbon dioxide out of the atmosphere, atmospheric CO2 levels have declined over the history of the Earth and in perhaps 500 million years time the level will have dropped so low as to prevent photosynthesis in plants. So in the future photosynthesis will collapse, taking the surface aerobic ecosystems with it, long before external factors like the brightening sun sterilize the planet. This is certainly an interesting idea, and Ward should be applauded for contesting the received wisdom of a Gaian biosphere that is so often accepted without question. But many of the examples of Medean events over the history of life cited in the book seem weak and not convincingly illustrative of the proclaimed effects. Indeed, some postulates of the book are questionable, and threaten to undermine the argument. Specifically, the claim that the number and diversity of microbes have decreased since the evolution of metazoan life seems utterly without support. 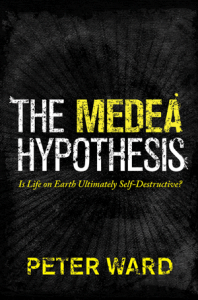 The Medea Hypothesis is a valuable and well-needed challenge to the hegemony of Gaian thought, and this is a very clearly presented and thought provoking book. The true situation is almost certainly that life is neither purely Gaian nor purely Medean but exhibits facets of both personalities of both in different circumstances; sometimes stabilising sometimes disruptive. Ward’s book is a crucial step in opening this debate and I would certainly recommend reading it, but with a critical eye open for chinks in the argument.